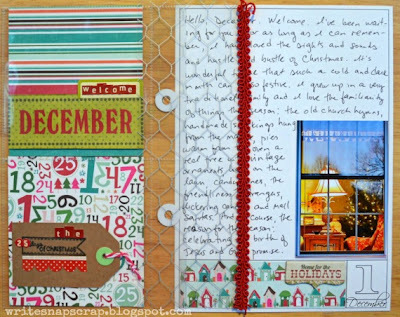 Write Snap Scrap: Well, hello December! December does this every year: I blink and it’s here! December is ushering in lots of exciting things. The new issue of PaperHaus magazine is out and it’s amazing. I’m excited to be a contributor. 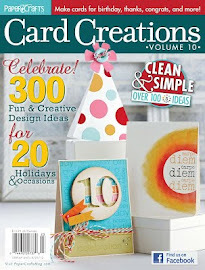 You can see the new issue here. 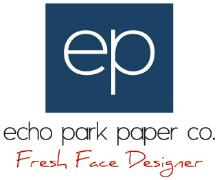 The PaperHaus blog is giving away 12 great prizes, one prize a day for the first 12 days of December. Be sure to hop over there and leave a comment. Today’s prize is from Prima. 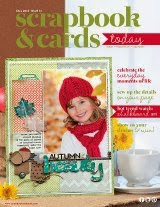 December 1 also marks the day for sneak peaks for the new kits at My Creative Scrapbook. Below is a sneak at one of my projects. The full reveal is December 5 and the Design Team has outdone itself. 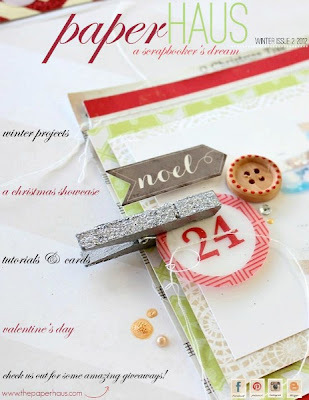 The holiday projects are amazing and we'll have tips and tutorials on the blog every day this month. 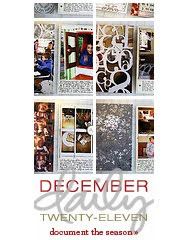 Last year, I decided to document my family’s holiday season with a December Daily. It was the first time I undertook the project and I’ll be honest: I didn’t finish. So this is the year! The year to finish last year’s December Daily that is. I did journal every day last year and I put a post it note in my December Daily of what we did. So even though I didn’t finish the album, I have a good record of what we did and for most days, I printed the photos, and slipped them in the page protectors too. 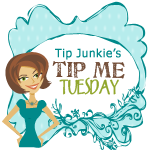 But since I didn’t have all my foundation pages premade, I found I just couldn’t keep up. 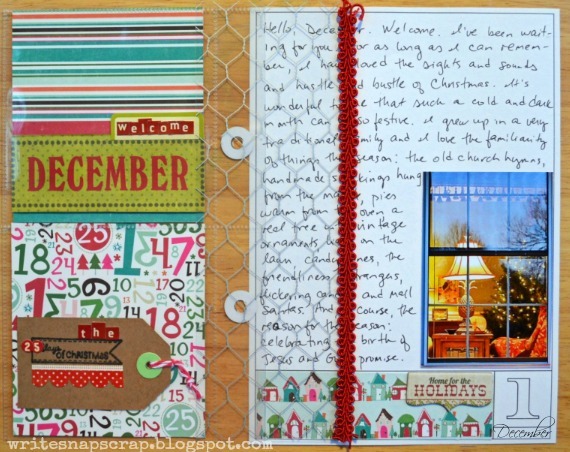 So, this year on my blog, I am going to post each day of my 2011 December Daily. Some days will be pages I’ve already done and some will be new pages that record last year’s activities. 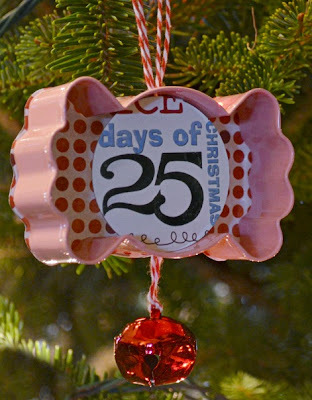 When I get to December 25, I will have completed my 2011 December Daily. Yay! That’s the plan anyway. I started my December Daily with a photo from outside the house looking in. I used an Ali Edwards template for 6x8 pages and followed her general design. Every day except Dec. 1 has a foundation page on the left and a journaling/photo page on the right. Thanks for stopping by. I hope your December is off to a great start! You've been busy! I'm looking forward to seeing more of your DD. I've never done one. Maybe it's time. :) I love the photo looking into the house. Awesome perspective! Ohhhhhhhh I love the sneak!! And YAY for the DD!!! I can't wait to see more!!!! Thanks for sharing your page. Lovely! Looking forward to seeing you DD! 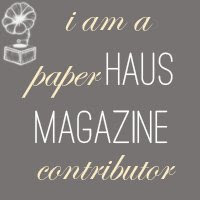 Oh, and I loved the new issue of Paper Haus! This is a great idea to get it finihsed. Will be watching along!